Book now the best shore excursions in Honnigsvag. High quality and safety at the lowest prices. 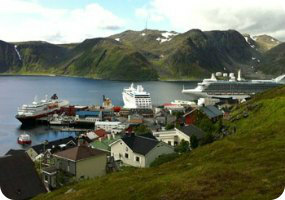 If your are looking for Shore Excursion Honningsvag, book now the best guided tours at lowest price with Ancora Tours. Since 2003 we offer you official guides in english, transportation and travel insurance, all included. The highest quality at the lowest rates. Many cities in Norway are relatively small, but their appeal is huge. Honningsvag, for example, has a population of less than 2,500 people, but is located in a Norwegian paradise. Come along on our shore excursion and experience this dramatic setting for yourself. Extra Fees: There are no extra fees in the shore excursion in Honningsvag. What’s eating: If you’re feeling brave why not try Torsketunger? This Norwegian delicacy is otherwise known as cod’s tongue! Souvenir: Aquavit, a Norwegian liquor flavoured with caraway or dill. Code Dress: Comfortable boots or walking shoes. A raincoat or umbrella, waterproofs. Generally warm clothes, with a hat and gloves, sunglasses. Honningsvag, the northernmost city in Norway, is located in a beautiful bay in the Barents Sea. Our shore excursion will explore this remote city and discover what life is like here for the few local residents. At the steep cliff face of the North Cape, a 40-minute drive away, we’ll have the opportunity to gaze outwards from the most northern point of Europe. From this large rock plateau, on which only sparse vegetation can survive, we can admire spectacular views out to sea. The North Cape is one of the few places on earth where it’s possible to view the midnight sun. After the Honningsvag shore excursion we’ll return to the harbour for boarding.